Finally, there exists a game that allows me to fulfill my lifelong dream of becoming a lawyer. Okay, while that’s not completely true, Phoenix Wright: Ace Attorney is still a fun and enjoyable game. 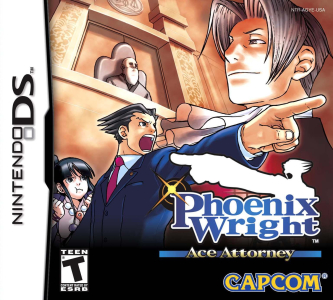 In this quirky, rather-on-the-Japanese-side DS/Wii/GBA game, you take on the role of young, bumbling defence attorney Phoenix Wright. With a name like that, could you really have any other than to defend the innocent? Throughout the five cases, Phoenix comes into his own as a lawyer, solving crimes, making friends, and making a few enemies, too. He stays bumbling, though. Just to keep your ego in check after saving innocent people from jail, I guess. This game really stands out when it comes to characters and scenarios. Let’s face it. 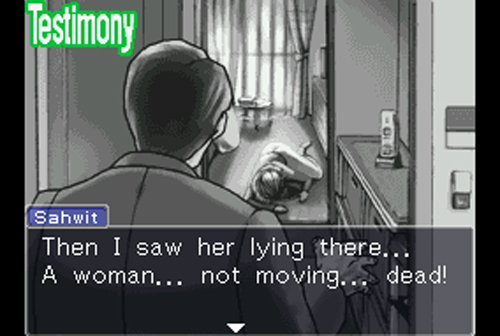 Ace Attorney is basically an interactive novel. It can be a little linear, and you can’t move on until you’ve uncovered every available clue and plot point. This means that in order for it to be a good game, it has to be as well-written as a book. 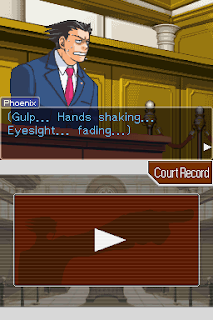 Phoenix Wright: Ace Attorney does this, well. The crimes are inventive – defending your nemesis who is wanted for murder, or helping a young girl clear her sister’s name of a murder she’s already confessed to, for example – and the characters stand out. Maybe you dislike Phoenix for being an idiot, or Larry for being a total tool, or Sal for… just being Sal, but these characters are fun. They’re hilarious, but they all have their dramatic points, their serious characteristics that make them matter. This is kind of important in a story where the main character making a wrong move could mean someone’s imprisonment. In order to solve these crimes and free your clients, you investigate the world and people around you. A little unorthodox for a lawyer? Yes, but it beats taking a bar exam. You have the option to talk to characters to learn everything you can, look for clues in a point-and-click fashion, move around the world, and present your findings to characters to try to figure out all you can about the case at hand. The exploration can feel a little limited, since you’re pretty much just pointing at a one-dimensional page and going, “what’s that? What’s over there? Who’s she?” at everything, but the silly dialogue and inner monologue certainly make it worth doing, and you do still learn a lot. Some people really enjoy the exploring portion of the game. Others prefer the other main component. See, once all the learning’s done, it’s off to the courtroom, where you must use logic and attention to details to disprove witness testimonies, argue with the prosecution (with a firm OBJECTION! ), and prove your client not guilty. Careful, though: too many wrong moves and you’ll try the judge’s patience. You have what could be described as lives, and each time you show wrong evidence, you’re liable to lose a life, and when they’re all lost, it’s game over. The difficulty increases at a nice, easy pace, allowing players to firmly grasp the logic of this unique game. The opening case does a very good job of getting players used to this new world, which is good, since there’s no game exactly like Phoenix Wright: Ace Attorney, and one has to get used to the logic of the universe. By the fifth and final case, you might be wracking your brain for answers and clues though, as it does eventually get tough, especially if you’re not a logic or detail-oriented person. Just be happy you’re not actually in the courtroom, so no one can see you looking up the answers. If you choose to figure everything out on your own, this game offers a fair amount of play time to enjoy its fun world. Even though some characters may be annoying, you might get stuck here and there, and there isn’t always a lot to explore during the exploration portion of Phoenix Wright: Ace Attorney, this cult classic is charming, entertaining and original. And man, do you feel smart once you finally, finally come up with that one piece of evidence you needed to prove a character innocent! This game is for people who are willing to sit around and think before they reach a conclusion, but what’s nice is that if you’re not that kind of person but you’re still interested in it, it’s just as much fun to watch a friend play it, thanks to its book-like nature.